To achieve complex nanopore function and especially transport design we independently tune nanopore structure, its functionalization and architecture. Membrane architecture is a critical parameter to control pressure-free transport and relates as well to local functionalization and step gradient formation. For example layer porosity and thickness design have to be correlated with the range of transport determining interface phenomena such as debye-screening length and wetting. Furthermore, innovative strategies for layer selective functionalization in multilayer systems are investigated. Paper is a complex and strongly hierarchical material. Especially the role of fiber nanoporosity on paper performance is not well understood and almost impossible to control within the paper fabrication process. We use our expertise in the field of nanoporous material fabrication to design and investigate the effect of hierarchical matrix and spatially confined nanopores on paper performance. 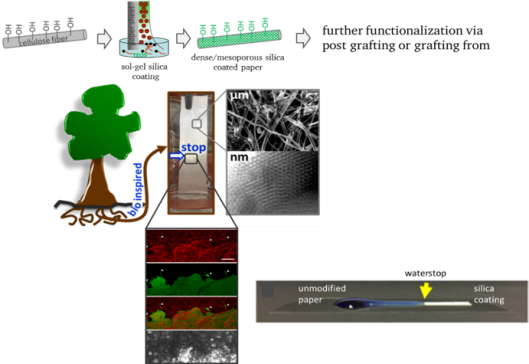 Together with the paper design expertise of the research group around Prof. M. Biesalski we designed fluid stop barriers fully based with itself hydrophilic materials exclusively by controlling silica deposition, nanopore presence and paper cellulose fiber composition. C. Dubois, N. Herzog, C. Rüttiger, A. Geißler, E. Grange, U. Kunz, H.-J. Klebe, M. Biesaski, T. Meckel, T. Gutmann, M. Gallei, and A. Andrieu-Brunsen, “Fluid Flow Programming in Paper-Derived Silica−Polymer Hybrids”, Langmuir, 2017, 33 (1), pp 332–339.